Things were looking quite bleak for the organisers of the Nexa P1 Powerboat races even before it all started. 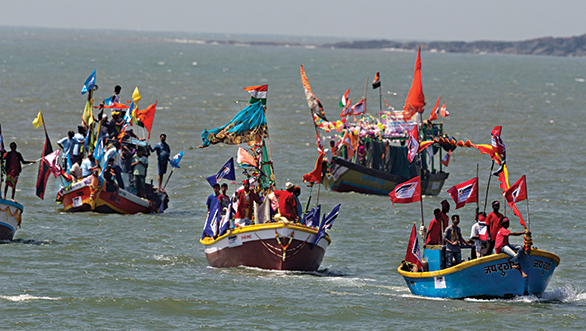 First, the grand launch event at Gateway of India was disrupted by the local municipal corporation. 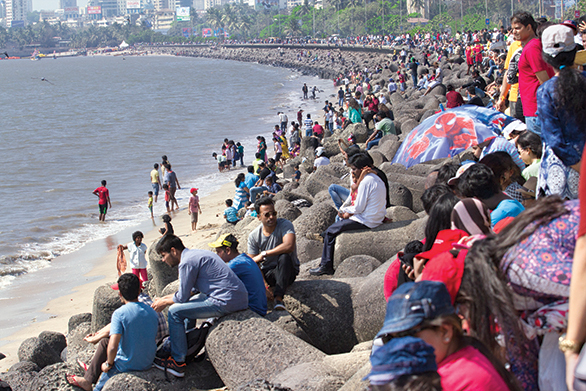 Later, they didn't receive permission to set up a temporary jetty and medical tents on Chowpatty Beach until a couple of days before the event. If that wasn't enough, the boats hadn't come in on time and when they did, they seemed to be breaking down. Or at least that's what the rumours were. But unlike most other motorsport events in the country, this one seemed to get the attention of not only the motorsport fanatics, but of almost everyone else in the city. The event was in the news for some reason or the other, and I suppose there's no such thing as bad publicity, which seemed to work in their favour. I was quite excited about the races, especially considering CS Santosh and Gaurav Gill, two of the biggest names in Indian motorsport, were finally going to be on the same playing field. And it's not like each of their boats was going to be specced differently either. 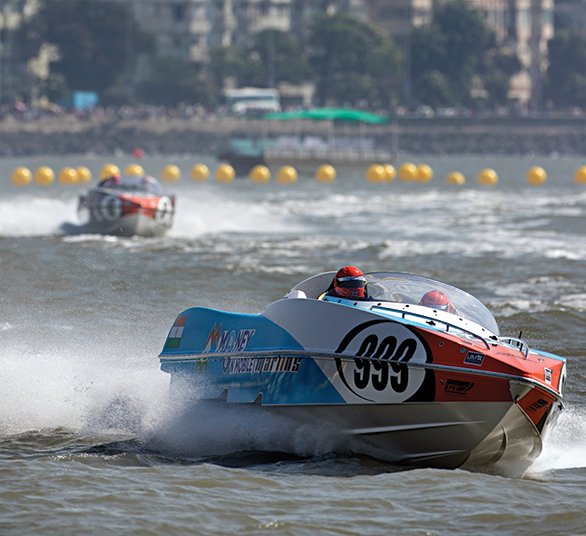 The P1 Powerboat Championship is very much like a one-make series. All the boats are identical in terms of capability, and when it comes to winning a race, it's all down to the skills and experience of the driver and navigator. But I'll have to admit, I just wasn't sure that the races would take place right up until I saw the flag-off on D-Day. 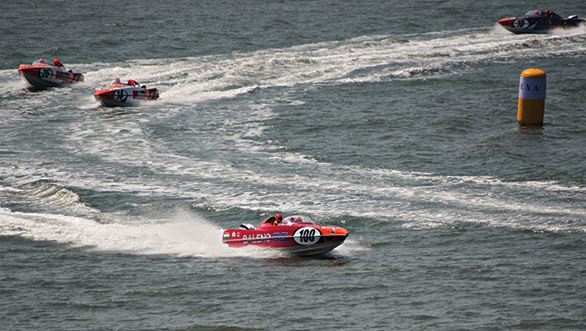 If you did manage to catch the P1 Powerboat races on TV last month and said, "Hey, that doesn't look too fast," or "That's not very different from car racing," you couldn't be further from the truth. In fact, the only things that one of these boats has in common with a car are the steering wheel and an accelerator pedal. To put things into perspective, put yourself in a 250PS sportscar, driving flat-out around a dirt track with no seat belts, no suspension and no brakes. Oh also, the track is full of ruts and bumps of different sizes, some as high as one metre, which are constantly moving. Sounds difficult, right? Well, that's just the tip of the iceberg. Like with onshore racing, there's a hundred and one other things you have to take into consideration like the strength and direction of the wind, the type of shoreline and even which angle you want the engine to be pointing at. I'll admit, I didn't understand most of what was going on during the first half of the qualifying session till John Wilson, the team manager of the Baleno RS Booster Jets sat down and explained what exactly went into making a fast lap. 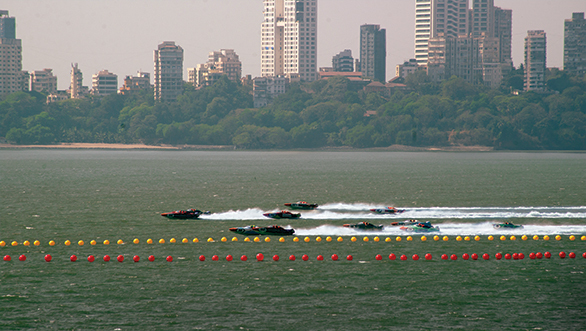 The fastest time around the circuit isn't achieved just by following the racing line, but also by ensuring that the boat is in the water for as little time as possible. I know that might come of sounding a bit odd, but if you think about it  water is thicker than air and causes more drag too. So essentially, the boat is fastest when it's just skimming and jumping over the waves, which is exactly what these machines have been designed to do. But that's also what makes them one of the most uncomfortable rides I've ever been on. It was a very short ride as a passenger on Sam and Daisy Coleman's boat because they had to head out for practice. But that one minute in the boat gave me an idea of just how much effort went into piloting one. "It's all about keeping the boat balanced," he said as he wrestled with the steering to keep the boat going straight. We were doing around 100kmph by this time, and I felt like I was on a horse galloping at full speed. The seats have thankfully got about three inches of travel because of a small suspension set-up, and that made the ride just a little more bearable as I held on to the grab rails hoping I wouldn't get thrown off. Then came the turn where Coleman had to slide the boat sideways, almost like in a rally car. I remember shouting over the loud whine of the engine and telling him, "I've been in some really fast cars, but this is just something else!" Coleman, who used to race in Motocross, says that he finds it more relatable to a motorcycle than a car because of how much movement there is. Santosh, on the other hand, says it's very different from what he's used to. He says that going from using a handlebar and his body weight to move the motorcycle to sitting in a seat and holding a steering wheel is quite a challenge. While Gill is used to racing with a steering wheel, "There's a lot more to look into," he says. "Compared to a rally car, it's non-responsive because it's such a huge boat. And if there are choppy seas, that's something we need to look out for because the boats can really jump around, shift positions and jump from one place to another pretty quickly." But he did say that his past experience racing Formula cars should help him in this circuit-style racing. 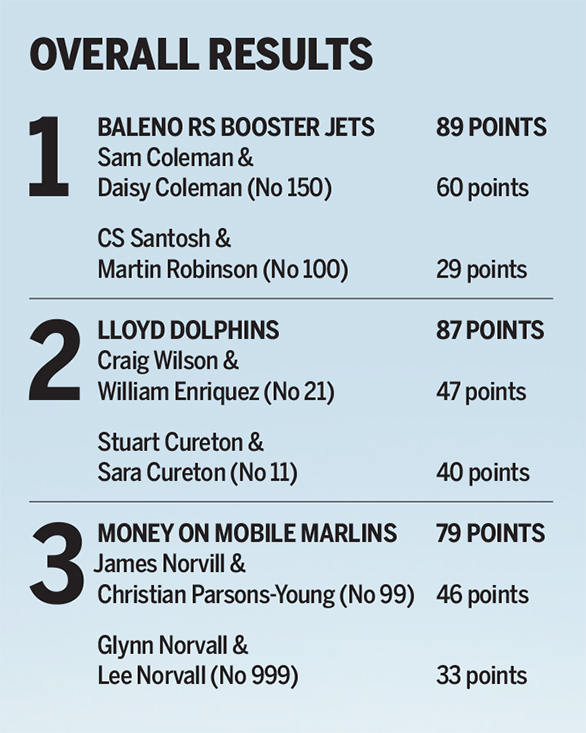 By the end of qualifying, it was the Coleman siblings, from team Baleno RS Booster Jets that managed to secure pole with a time of 2m25.73s, but only by that much! James Norvill and Christian Parsons-Young from the Money on Mobile Marlins took P2 by just 100th of a second. It was a nail-biting moment for Wilson and everyone else watching the session. 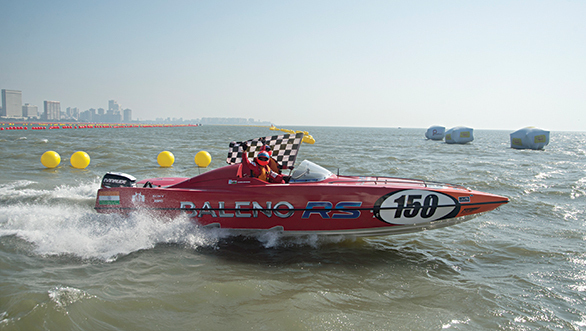 Santosh and his navigator, Martin Robinson, who were racing for team Baleno RS Booster Jets, managed a time of 2m31.54s around the 5.2km course giving them P9. Gill and his navigator, George Ivey, were racing for the Ultra Sharks and managed to outpace the other two by a small margin with a time of 2m30.6s, giving them P7. The next day, I was quite puzzled when I saw the start grid for Race 1. As far as I knew, a start grid had the pole sitter right up front while all the others are placed behind according to the qualifying results. Here, however, all the competitors start parallel to each other, with the pole sitter place closest to the inside line. It's a running start, which makes it seem like a mad dash towards the first corner. The team that manages to grab the lead after that has got a good advantage because they get clean water to race on while the others are stuck with dirty water. 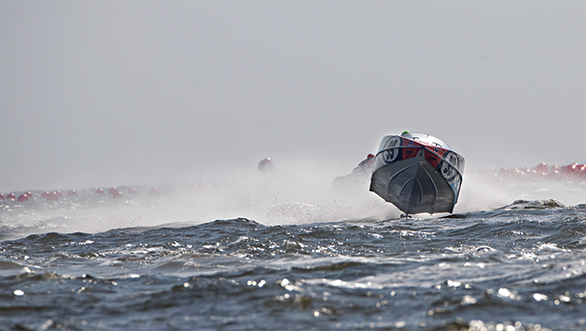 The concept of clean and dirty water is similar to that of clean and dirty air in onshore racing. The propeller of the boat ahead leaves air bubbles in its wake, which means the propeller of the boat behind can't push through the water as effectively, slowing it down. Additionally, the already uneven water is disturbed further making the boats quite unstable. Although the Colemans were on pole, they lost the lead to Norvill heading into the first corner. But they set themselves up perfectly to regain the lead a few corners down. A couple of laps later the race seemed to settle into a steady pace with the Colemans in the lead even after completing their pit laps. A pit lap (something like a joker lap in rallycross) is a longer loop of the track, and each boat has to complete two of them in a 15-lap race. Deciding when to take them depends on where you are in the race. If you're at the head and you have a significant lead, completing them would be ideal as the others wouldn't be able to catch up with you. If you're stuck behind another boat and can't find a clean line to get past him, you could take the pit lap to get on some clean water and make up time. 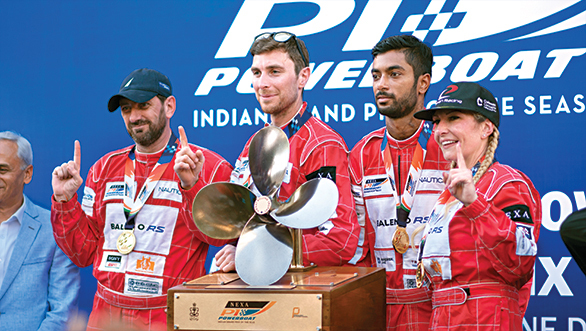 The Colemans had won the race, while John Donnelly and Kevin Burdock of team Mirchi Mavericks took second. Gill, meanwhile, had finished fifth overall, while Santosh took eighth. I was looking forward to Race 2 because it was a reverse grid, which pushed the Colemans right to the end. The sea was also rougher than it was during the first race. While Donnelly and Burdock took the lead ,within a couple of laps, the Colemans had managed to get right on their tail. They eventually took the lead and held it right to the end, while Donnelly was in third till the final lap. In one of the last couple of corners before the finish, he was stuck in the wake of Norvill's boat when an engine mount gave way. The next thing I knew, his boat was upside down in the water while the engine was floating away. The rescue team was there almost immediately and pulled the driver and navigator to safety. So what do I have to look out for? Everything." The grid for the final 20-lap race was based on who scored the maximum points after the first two races, and naturally it was the Colemans who were on pole. Gill was at an impressive fifth on the grid while Santosh was eighth. There must have been quite a bit of pressure on Santosh because even if the Colemans won the final race, the only way they could win the championship was as a team. So if Santosh didn't do well, everything the Colemans did over the weekend would have been a waste. Hoping to get as close to the action as possible, I decided to watch from a boat that took me right to the middle of the course. While Gill took fourth just a couple of laps into the race, he started to back off by Lap 9. While the Colemans were at it again right at the front of the pack, Santosh was playing it safe further behind in the pack aiming to complete the race in a decent position. And this strategy paid off, because with the Colemans winning all three races, they scored enough points for both boats to take the overall title. I managed to get a hold of Gill later and he seemed quite annoyed because he had a podium finish in his grasp when an engine mount got loose and forced him to slow down. But he admitted that he underestimated this event and that it got quite scary at some points. Finishing fifth overall isn't too bad especially given that he was competing against world-class boat racers who had more than twice the amount of time on water than he did. But it just didn't seem enough for him. Then again, I don't think settling for anything but first is good enough for top athletes. By the end of it all, I think everyone, including me, was just happy that the event had run without any major hiccups. Why was I glad? Mostly because it's the dawn of a new form of motorsport in India  something that the country has never seen. And if this does develop into a world series like the organisers are saying it will, then it's just one more avenue for Indians to step up and try to make a mark in. Gill and Santosh's performance here only prove that it's possible.